The job of constructing 130 torches that will be handed to over 2,000 people and trek across over 3,000 miles in 92 counties of Indiana takes a lot of work and a lot of people. In fact, it took about 70 engineering students, staff, and faculty from seven programs within the College of Engineering at Purdue, according to Professor Timothée Pourpoint, the program manager for the torch project at Purdue University in West Lafayette, Indiana. These students, staff members and faculty members are from the aeronautical and astronautical engineering, agricultural & biological engineering, electrical and computer engineering, engineering education, environmental and ecological engineering, materials engineering and mechanical engineering programs. Discussions between the state and Purdue started in the summer of 2014, Pourpoint said. A group of students in mechanical engineering began work on an early torch prototype in the fall semester of 2014 as their senior design project before Purdue was officially tasked with constructing the torch. The flagship torch is 23.5 inches tall and has an 8-inch diameter at the top, according to the torch fact sheet. It is made of aluminum, including the two rings of the torch, a state-of-the-art aluminum-lithium alloy donated and machined by Alcoa. This new alloy, coupled with a close collaboration between aerospace engineering students and Alcoa engineers, means the torch shell weighs just under 2 pounds. Fully equipped with its burner and electronic features, the torch weighs about 3.5 pounds. There are 19 stars in total on the torch, representing Indiana’s place as the 19th state in the Union. Thirteen of the stars are around the top ring of the torch, representing the 13 original states that became states between 1787 and 1790. Five stars are around the second ring of the torch to represent the five states that joined the union between 1791 and 1812. 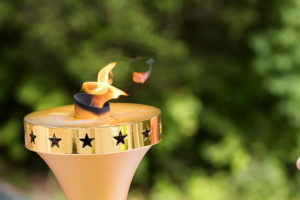 The final star, representing Indiana’s becoming a state, is found at the base of the flame. Aeronautical engineering students were in charge of the aerodynamics of the torch, its fuel and burner systems. They were the overall systems integrators for the project. The Aeronautical and Astronautical engineering students experimented with the fuel for each torch. Their job, Pourpoint said, was to find the right fuel for the torches, one that would have the necessary lifetime so it wouldn’t die in the middle of a run, and one that would produce a big enough flame to be seen. “It was desirable that the torch fuel and materials be sourced in Indiana, so going to E85, an ethanol-gasoline blend made in Indiana, made a lot of sense,” Pourpoint said. E85, though, Pourpoint said, burns cleanly and doesn’t produce a very bright flame. Such a bright flame is necessary to ensure that the flame is visible from far away and on sunny days. To solve the issue, Pourpoint and Nate Mosier, a professor of agricultural and biological engineering at Purdue, worked together to come up with the perfect fuel. In the final fuel mixture, kerosene is added to the ethanol to create the necessary red and yellow visible flame. Material engineering students were in charge of finding the right materials and metals for the torch. Environmental and ecological engineering students, Pourpoint continued, documented the environmental initiatives in all 92 counties in Indiana, assembling the information in a nearly 200 page document available on the Indiana Torch Relay website. All Hoosiers and anyone visiting Indiana can now learn about these initiatives. Johnson and his students’ part of the project was on the inside of the torch. They are the minds behind a method of detecting the tilt of the torch, as well as cameras in both front and back and the GPS tracking system inside the torches. 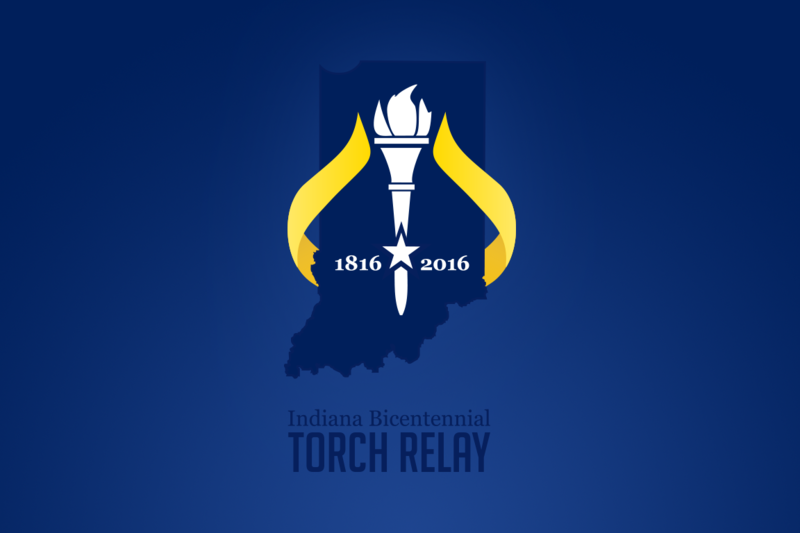 With the GPS, people can track where the torch is throughout its relay across Indiana. Pourpoint’s students were in charge of the mechanical safety mechanism that cuts off the flame’s air supply if it tilts past 45 degrees. These duties also included the electronics inside the torch that would communicate the button push to the camera to take a picture and a Wi-Fi connection within the support vehicle that travels in the caravan behind the torch that would transmit the pictures and GPS tracking to a server so they could be put online. The state wanted a torch that would resemble the torch on Indiana’s flag, and Purdue came through. There is also a smaller, flameless, torch that the Purdue team created. This torch is 14 inches tall and has a plastic housing 3D printed to look like a flame. A programmable strip of LED lights serves as the “flame” and creates different patterns of color for the torchbearer. This torch was designed by Engineering Projects in Community Service (EPICS) teams at Purdue. It is mainly meant for use by children and those wanting an alternative to carrying a real flame. The goal of the project was to create a product that, when kids or others carry it, they feel like they are carrying a scale model of the torch, said Sean Brophy, associate professor at Purdue. To ensure this, Pourpoint shared the design specifications of the flagship torch with the team at EPICS, so they could create the flameless torch. Brophy led the project for the flameless torch. 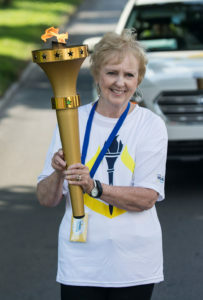 In the beginning, he said, this torch was meant to be used only by the children who would carry the torch in the relay. Brophy said he found, though, that there were many other people who wanted a torch that was a little lighter and easier to carry. One of the main parts of the flameless torch project was creating a realistic flame. Brophy said his students looked at many different options when creating this part. One of those options involved an LED light, reflective fabric cut in the shape of a flame and a small fan to blow the fabric. This was the most realistic looking flame, but Brophy said it worked best as a static flame and that this solution would not work well as the torch was in motion, or in the event of rain. The final flame design came from the team’s research using scale models from an artist’s clay model and other objects with flames like toys and statues. It is made from a translucent material, so that the outline of the flame can be seen even when it is not on. The electronics in the flameless torch were a senior design project. A senior student in EPICS took responsibility for this part of the design. Brophy said this is appropriate, as the goal of a university is to mentor students, and this project provided the student with a leadership role. Like the flagship torch, the flameless torch is made from materials sourced in Indiana. The Purdue students managed the design and donation of the 3D-printed handle, which was made by Hoosier Pattern in Decatur, Indiana. Both the handle and the LED “flame” were tested by children from Sunnyside Intermediate School in Lafayette. The children provided comments on the look and feel of the torch. The students on the EPICS team in exchange provided insights on careers in STEM fields. Brophy and his students also worked with the teachers to develop a curriculum that other teachers could use in their social studies class. The collaborations within the College of Engineering were one of Pourpoint’s favorite parts of the torch project, he said. For example, during the project, he got to meet new people, like Nate Mosier, who he said he may work with on a future project. The two hadn’t met before the torch project. But it’s also the “people factor,” he said, that he enjoyed. 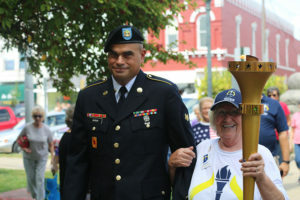 When the torch made its way through Indiana, Pourpoint got to enjoy the smiles and excitement on its viewers’ faces. © 2016 Ball State University. All Rights Reserved.